It's not Daleks or Cybermen threatening the Doctor in the third of the Doctor Who adventure games. This time, the danger comes from a certain blue box. As fans of Doctor Who are aware, the TARDIS is a pretty unique vehicle: practically infinite in size, and filled with libraries and swimming pools and more besides. It's not just a way to get around; it's a place to have adventures. This fact has not been lost on the studio behind the Doctor Who adventure games, who have set the third installment within the confines of the Doctor's conveyance. In the episode, which is called TARDIS, the player must discover why the titular blue box is acting so strangely. There will be monsters to battle and secrets to uncover, and at the end of the game, players will get the chance to pilot the TARDIS for themselves. 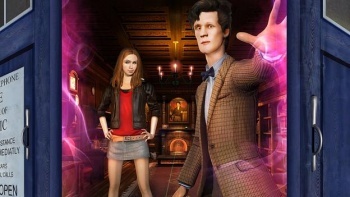 Doctor Who lead writer Steven Moffat said that the game was a "brilliant adventure" and that it was everything a good episode of the show should be. For those in the UK, TARDIS will be available as a free download from the BBC website on August 27th. Those outside the UK will able to purchase it on the same day.